Imagine driving on a highway with beautiful surroundings. You might notice how things begin to get smaller as you move further away. The road seems to meet at a single point from a particular distance. One-point perspective revolves around the same concept. It is about two parallel lines meeting at a vanishing point. Perspective drawings can be from one-point all the way up to 6-points. Let me talk about one-point perspective today. I wish you many pertinent pencil strokes! The vanishing point is at infinity. Objects get smaller as they recede towards infinity. Thus, all the objects disappear at the vanishing point. Parallel lines of infinite length appear as converging lines. Also, they meet at the same vanishing point. There can be many vanishing points. Yet, there is only a single one-point vanishing point. This is present at the centre of vision. The vanishing point can be on, above or below the horizon line. 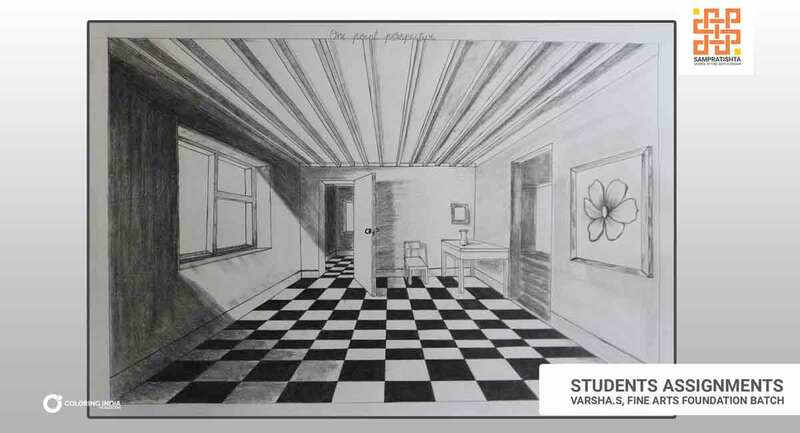 One-point perspective is a drawing method where you use a flat drawing surface. This method creates three-dimensional and realistic drawings. Also, lines and shapes in a drawing are present in reference to a single line, called the horizon line. The horizon line is the eye level line. Moreover, it represents the viewer’s level of sight. This method is quite popular among comic creators, cartoonists, architects and interior designers. WHEN CAN YOU APPLY ONE-POINT PERSPECTIVE? One-point perspective is appropriate when you can have a frontal view of the subject. In fact, the surfaces facing the viewer appear as their true shape, i.e. without any distortion. Also, the viewer can see the vanishing point located on the horizon line. The horizontal and vertical lines are in parallel with the picture plane. Draw the horizontal lines parallel to the horizon line. Next, draw the parallel lines perpendicular to it. Also, the depth is foreshortened. The foreshortened lines orient 90 degrees to the picture plane. These connect at the centre of vision. In fact, these lines create an illusion of distance and make drawings more realistic. What if there are two vanishing points? In fact, where do you see two vanishing points? Read our next blog about 2 points perspective. WHAT ARE THE FINEST ART INSTITUTES IN BANGALORE? There are many Art Schools around Bangalore that provide the necessary technicalities. Of course, Art schools structure their foundation programs in different ways. Yet, Sampratishta is the first art school to provide Diploma courses in Bangalore. We have seen students enjoy a holistic and hands-on method. Also, Pencil and Chai conducts weekend sessions.